Vape Kits & Mods | Guide: How to choose the right vape? New to vaping? Perfect we were all smokers who switched to vaping at some point in our life. The only difference is that when we were starting out, the technology was premature and the selection wasn’t all that great. Fast forward to 2019 and the vaping industry has evolved at an insane rate. We’ve now got all kinds of vape kits like sleek and portable AiO devices, super convenient pod style vapes and cloud making mods like the VooPoo Drag 2. We created a simple buying guide below, so keep reading it’s about to get wild. 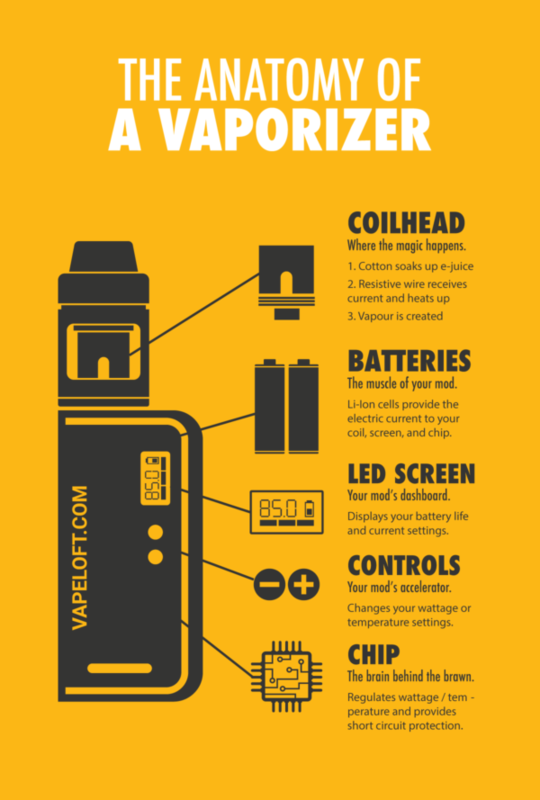 HOW DOES A VAPE KIT WORK? Vape Kits and mods are comprised of the device which houses a battery, a tank which is used to hold the ejuice, and a coil which heats that juice up to the point of vaporization. Since there are different types of vape kits, we will break them into all of their categories. Also known as All in One vape kits. These devices are some of the simplest to use and are recommended for beginners as there aren’t many controls to tinker with, or removable parts except the coils. Vape Pens strike a strong resemblance of an actual vape pen. They are also very simple to operate and don’t require much maintanance. Since the ever growing popularity of the JUUL vape kit, many manufacturers are releasing their own closed and open pod systems. Box mods are the most advanced form of vape kits, and have many features such as power adjustment and temperature control, customizable settings and much more. These devices are capable of producing massive vape clouds and deliver fantastic flavor. How to shop for the best vape kit? Due to the simplicity of these devices, they are often the primary choice for beginners, and most of the time the right choice. The only thing you will be doing for maintenance of these devices is replacing the coils or pods and refilling ejuice. There are usually no controls or fancy screens built into AiO devices, the only buttons you will find on these devices is for turning on/off the device and firing. Many of the AiO vape kits include an inhalation sensor which is activated every time you take a draw off your device, which is another reason new vapers prefer the AiO vape kit. All in One vape kits such as Pod Vapes like the open pod system Aspire Nautilus AiO or the closed pod systems like the JUUL kit or STLTH both fall into the AiO category of devices. Pod vape kits is a fairly new category of vape kits that is growing at an insane rate. One of the standout features of the pod system is the ability to carry several pods with you and easily switch between flavors. Vape Pens is another style of device which belongs to the AiO category since it’s functions and features are the same. The reason this bad boy gets it’s own category is the fact that it’s the closest looking thing to a cigarette. These are just some of the features of box mods, you can read up product descriptions for specific features of each device. Due to the complexity of these devices, the box vape kits aren’t always the first choice for beginners. However there are many smokers that choose to start with devices like the VooPoo Drag Mini which is a great box mod due to it’s styling, durability and performance. If you are planning on purchasing an advanced box mod, or perhaps you may even want to dabble in rebuilding your own atomizer coils you should always keep in mind that battery safety is extremely important. Which vape kit is best for me?